Most mornings we set off around 7am from our apartment building in Reykjavik, first light was around 9am with sunrise happening around 10. This took some getting used to but had some very distinct advantages. There certainly wasn’t a need to get up at 3am, as has been the case this last summer here in Cornwall, to capture the dawn light. One particular morning we set off for the very southernmost tip of Iceland. I wanted to capture the dawn from the lighthouse there. This involved taking Þjóðvegur 1 or the Hringvegur, (ring road) otherwise known as route 1 from Reykjavik. This road circumnavigates Iceland and is 828 miles long. Two lanes for the most part, it has a speed restriction of 55 mph and speed cameras to enforce it. The road surface appears to be made up of compressed volcanic ash giving a lovely smooth surface but after a few miles, the shiny hire car delivered to you at the airport is covered in a fine grey film of dirt that builds with each mile. At many service stations you’ll see Icelanders hosing down their cars with pressure washers. This would account for rarely seeing a dirty car in Iceland. Our hire car was a disgrace by the final day. Shamed we tackled an automated car wash before returning the car. It took some working out. Anyway, I digress. Travelling along the Hringvegur in the dark, we could see little apart from the road ahead until, in the distance, we could see lights but were struggling to make sense of what we were seeing. As we got closer it became obvious, a beautifully floodlit waterfall took shape. The waterfall in question is called Seljalandsfoss and posting this picture gives me the opportunity to thank Chris who accompanied me on this trip, struggled with the luggage, carried my camera bag, helped me set up my shots, tolerated the constant stops and generally provided support without which, I couldn’t have made this trip. That’s Chris silhouetted to the left of the waterfall.. This entry was posted on December 4, 2014 by Chillbrook. It was filed under Photography, Photography and Travel and was tagged with Adrian Theze, Cornwall Photographic, EasyJet, Floodlit Waterfall, Iceland, Landscape Photography, Nikon D800e, Photography, Seljalandfoss, Silhouette, Waterfall. Hoping to go to Iceland (and Seljalandfoss) early next year! This has wetting the appetite, thanks! Thank you James. You’ll enjoy your trip, Iceland is a fabulous country! Fabulous shot, Adrian. I’m sure Chris will love to have this wonderful photo to remind him of all the good times you had together throughout the trip. It sounds like his help was invaluable to you. Thanks Adrian, I am thinking about a March 2016 trip to Iceland and thought the light might be about the same. Just wanted to check, thanks again. Oh I will, and thanks for the info on hours of light it does make a big difference to what you can do in a day. Certainly that Pat, thank you! Another great shot Adrian. The floodlighting makes this look other worldly…..it’s quite surreal. Gorgeous photo.I think I travel to Iceland next year. 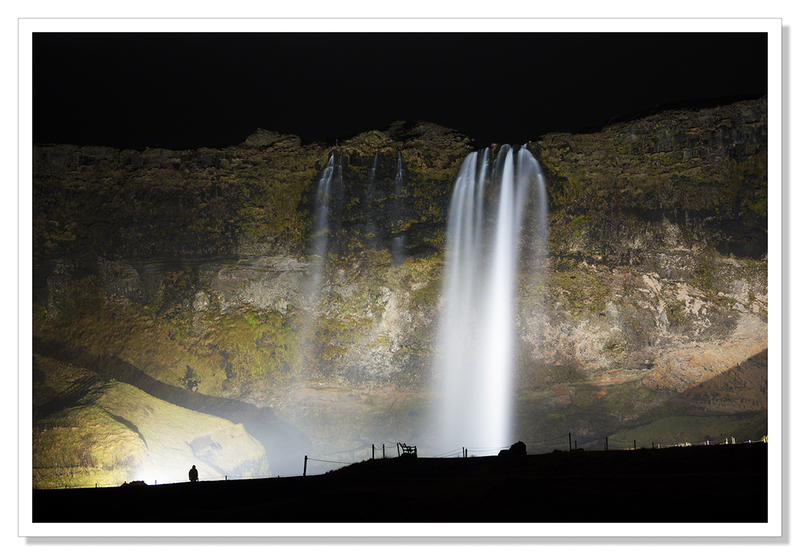 A great shot – quite different from anything I have seen of Seljalandfoss before. And I notice that here they have set up a fence the keep visitors away from the waterfall (I presume) which wasn’t there when I visited Iceland many, many years ago. Thank you Otto. This is one of the first stops the tour buses make. I was glad I was there before the crowds that would be visiting later in the day. I guess the authorities have have had to create walkways for that reason. It was something I was very aware of whilst in Iceland. It was budget airline flights that allowed me to visit and enjoy the wildnerness that Iceland has to offer but I fear for the future. With tourism up 20% in just five years, I wonder what the next five years will bring. More fences I imagine. Amazing photo, Adrian. I really like the black silhouettes below and above, with what’s going on in the middle. Thank you very much Harrie, much appreciated. Beautiful image, Adrian….spectacular light fantastically captured! I was wondering how you managed this trip….now, from your words in this post, I know! Just finished watching the BBC Four program on the Art of Cornwall and immediate thought of you. Being a typical American, I had never heard of Kit Wood, Ben Nicholson or Barbara Heywood. The program centered on the art colony at St. Ives, a fascinating story. So I’m in for the big treat now – Iceland through your eyes, with your descriptions. I have to work backwards through quite a few posts and I look forward to it. It’s been impossible to comment or even look at posts for over a week – too busy with work. Don’t have the energy of a 20-something. Or a 30-something. Etcetera!! So glad you have Chris, but you’re the one who made this happen and I admire that. Just stunning Adrian. How grateful we are for such natural wonders of the world! The Icelanders know a trick or two, highlighting their waterfalls like this in the short days of winter. Stunning image, Adrian. Thank you Andy. It was quite surreal seeing this disembodied waterfall appearing out of the darkness. So glad we set off so early that day or we’d not have seen it. It’s huge and magnificent! What amazing pictures you have made on this trip, Adrian. wonderful. For me as a photographer Karen, Iceland has been just brilliant. I’m very much looking forward to my return trip in February!